Thomas Jefferson was, by any reckoning, one of the most remarkable men ever to have crossed America's political stage. In 1776 he drafted the Declaration of Independence, and throughout the Revolution and in the posts he held thereafter - governor of Virginia, minister to France, secretary of state, vice president, and president - Jefferson's responsibilities were enormous and his accomplishments profound. Yet during those years he also was able to design his own house, Monticello, the magnificent Palladian mansion in central Virginia, and later to establish the University of Virginia and to plan its principal buildings. And, through all this, Jefferson made purchases for a lifetime. Needing to furnish not only Monticello but also the ministerial residence in Paris - the Hotel de Langeac - and the President's House in Washington, Jefferson bought with consummate taste and an extraordinary eye for the newest in American, English, and French styles. Fascinated by science and the growing field we now call "technology," Jefferson procured or had built devices for copying letters, telescopes for exploring the stars, and even dumbwaiters to minimize dependence on servants at mealtimes. He was keenly curious about his native land and devoted to promoting its virtues, and he acquired examples of its fossils, flora, and fauna and studied its indigenous peoples. Determined that the former colonies should both enjoy their cultural patrimony and preserve their own history, he purchased original paintings and had copied what could not be bought. He commissioned busts of his intellectual heroes, as well as of the heroes of the American struggle for independence. The Worlds of Thomas Jefferson assembles more than 150 of the objects Jefferson acquired - the first time they have been seen together since the contents of Monticello were dispersed at his death. This astonishing collection reveals the limitless range of his curiosity and the acuteness of his taste, portraying not only Jefferson the statesman but also Jefferson the architect, amateur scientist, connoisseur, farmer, and historian. The articles pictured and described range from priceless historical treasures, such as the lap desk on which the Declaration of Independence was composed, to the personal and homely, such as the wrist strap and dumbbell Jefferson was obliged to use after an injury; from precious objects of art, such as Gilbert Stuart's portraits of Jefferson, to the shards of porcelain found in excavations at Monticello; from the finely worked silver tumblers known as the "Wythe-Jefferson Cups" to the Mandan buffalo robe that was part of his collection of Native American artifacts; from the great Entrance Hall clock he designed for Monticello to the silk damask-upholstered chairs he purchased in Paris. In all, it is a collection that mirrors both the mind of America's greatest statesman and the tastes and styles of the time in history when the American people secured their own independence and offered the world an example of a free people in a democratic state. 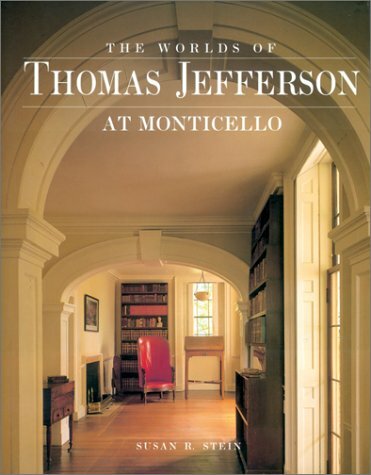 The Worlds of Thomas Jefferson is written by Susan R. Stein, curator of Monticello, who provides an introduction placing Jefferson's acquisitions within the context of his political career, family life, and intellectual pursuits. In the catalogue each object is described individually with details about its history as well as its importance to Jefferson. The neoclassical facade of Monticello, Thomas Jefferson's Virginia mansion, concealed busy interiors crammed with his eclectic collection of paintings, engravings, sculpture, scientific instruments, clocks, maps, Native American artifacts, specimens of natural history, musical instruments, silver, furniture, ceramics and personal objects. This sumptuous catalog with 327 illustrations (107 in color) of an exhibit at Monticello commemorating the 250th anniversary of Jefferson's birth provides a window on his polymathic activities as architect, naturalist, amateur scientist, gardener, historian and connoisseur. Objects shown here range from the desk on which the Declaration of Independence was written to moose antlers and Jefferson's walking stick. In her engaging essay, Stein, curator of Monticello, portrays a passionate collector who displayed both untutored taste and worldly sophistication.